In the most anticipated high school football game in the nation this season, CAC’s No. 1 St. John Bosco (Bellflower, Calif.) defeated No. 2 Mater Dei (Santa Ana, Calif.) 41-18 last Saturday in Southern California. Junior QB DJ Uiagalelei led the Braves with 279 yards in the air and five TDs, along with rushing for 60 yards. 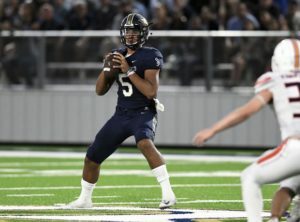 Even with the loss, this week’s new CAC Catholic High School Football poll, presented by Siena Heights University and Global Football, Mater Dei remains the No. 2 team in the country. Mater Dei takes on No. 10 JSerra on Friday night in another Trinity League clash. Another major matches this week include No. 25 Iona Prep (New Rochelle, N.Y.) at St. Anthony’s (South Huntington, N.Y.) and No. 22 Brother Rice (Chicago, Ill.) at Montini Catholic (Lombard, Ill.) with the Chicago Catholic League Blue championship at stake.